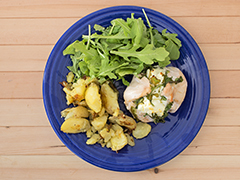 Free-run chicken breasts are elevated in this dish with chevre and arugula. 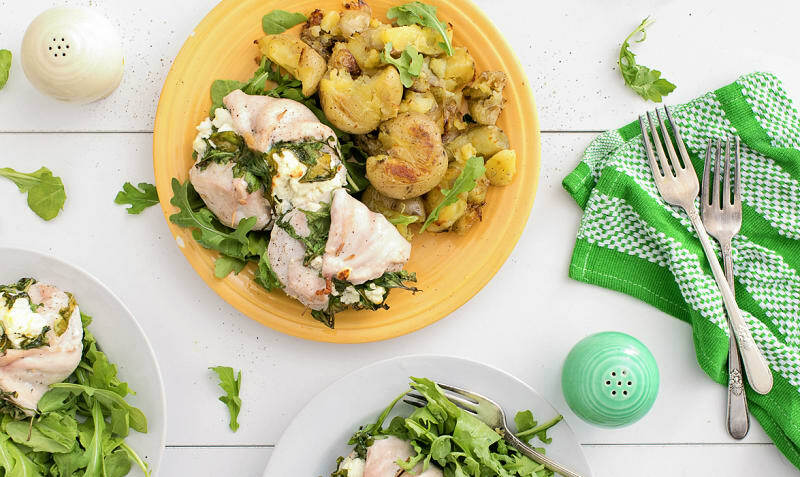 Served with delicious garlicky smashed potatoes, this meal will become a weeknight staple. Best prepared within two days of delivery. Preheat oven to 425°F. Line two baking sheets with parchment or silicon baking mat. 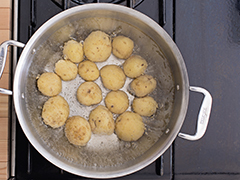 Wash potatoes, put them in a pot, and cover with cold water. Bring to a boil and cook until just tender (15-20 min). While potatoes boil, season the chicken with salt and pepper to taste. 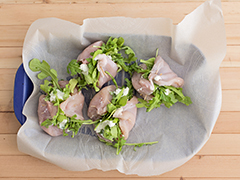 Lay the chicken smooth side down, layer each with arugula and crumble goat cheese in the centre of each piece. Roll the chicken tightly and seal with a toothpick. Place chicken, seam side up, on a parchment-lined baking sheet and bake for 25 minutes, or until internal temperature reaches 165°F. 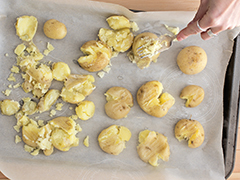 Once the potatoes are boiled, drain them and place onto a second parchment-lined baking sheet. Smash them with a fork. Mix together 2 tbsp olive oil, crushed garlic, and salt and pepper, then drizzle this mixture over the potatoes. Bake for 15-20 minutes, until potatoes are crisp. Once chicken and potatoes are cooked, serve onto 4 plates. Add a handful or two of remaining arugula to each plate and drizzle with oil and vinegar (or your favourite salad dressing). Serve.